We wrap up this series on job shop leadership by considering a topic that pervades many shops – something that could be driving employee behavior more than we realize. Look at the picture; what do we see? It’s the beautiful bride, of course. We note in passing that she’s wearing a veil but take little notice of it. It’s not something that would distract most of us. That’s how it should be, but what does this have to do with leadership in job shops? Well, let’s look at two images found in job shops the world over – the ubiquitous organization chart and the process flow diagram of the business. 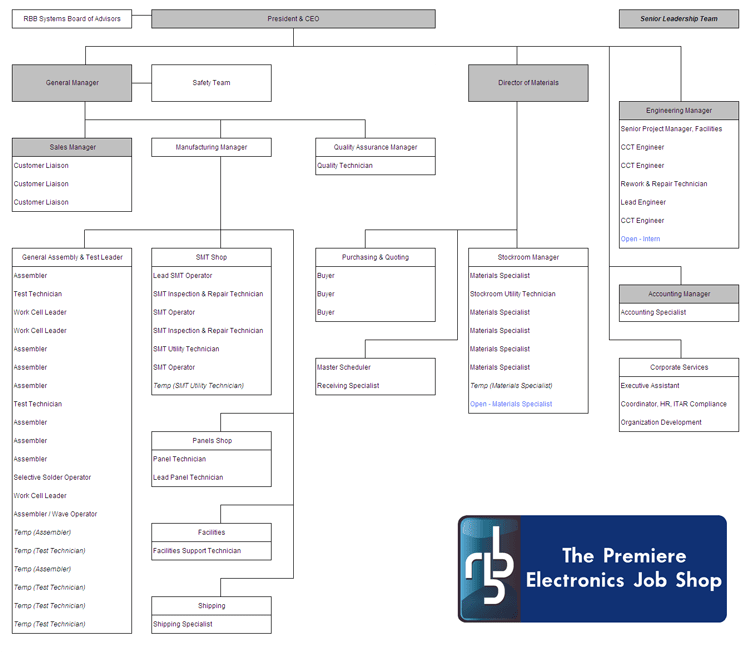 The org chart conveys general responsibilities, job titles, who reports to whom, what the official “chain of command” is supposed to be, and related information. It is helpful for quickly communicating relative levels of influence, especially with people that are outside of the organization. Process flow diagrams show the sequence of activities. The one shown here is the most basic, for illustration purposes. These are less common than org charts but every enterprise can make one readily. It’s what the people are actually doing each day to serve customers. Here is RBB’s org chart. I’ll bet that yours looks similar. Okay, so now think about this: of the two drawings above, which one is the bride and which one is the veil? This is not an obvious answer. Many people don’t see it, but a moment’s reflection reveals the answer: the business process is the bride! It’s what really matters! The health of the business depends on how things flow, whereas the org chart is simply the way we have divvied up our talents to accomplish these processes. In your own shop, how often has your process changed compared to your org chart? Think of it this way. The chain of command matters, yes, but only in the successful accomplishment of the mission. As often as necessary we reorganize ourselves to accomplish our mission; we never change our mission to accommodate our structure. Employees at vibrant, growing job shops look through the veil and concentrate on the work at hand. They don’t worry much about who “should” do what, according to Hoyle. Get the job done right and quickly is their mantra. They sense the health of the bride (the daily business) and act, even if it means apologizing for overstepping their authority on occasion. Just as important – managers and supervisors foster this environment. They have small egos and toes (it’s hard to step on them). Risks taken for the bride’s benefit are rewarded, not punished. They don’t take themselves too seriously. In these healthy shops the org chart is seen as a communication tool, nothing more. They refuse to let it dictate their behavior. At RBB we move heaven and earth to get our small batch customers what they need, when they need it. Our customers don’t care much about how we’re organized, do they? I leave you with a final challenge. What are you or your people doing this week that serves the veil instead of the bride? And are you okay with that?